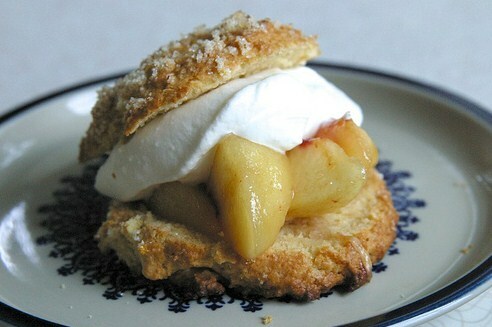 Peaches And Cream Shortcakes - I think I mentioned in my previous post that my husband and I recently went back to Nebraska for the first time in three years. 'This was a recipe that I intended to make before that trip. 'Well before. 'But well, it just didn't happen. 'Then, when we got back, I had intended to make it this past weekend. 'Instead I decided to bake something else, which ended up totally not worth wasting your time. 'I knew it as I was making it that it wasn't going to be good, but I had hopes. 'Most importantly, I had all the ingredients and some free time. 'I should have listened to my instinct because man, it was a flop. 'I hate flops, especially in baking. 'Like that one time I made my husband an awesome birthday cake in a bundt pan, and let it cool down enough (so I thought) and when I flipped it over, it came flying out into a giant cake pile. 'A delicious cake pile at least, but still not worth serving to party guests. 'Which thankfully all cancelled on coming anyway, due to the 4 or so inches of snow we got here in North Carolina at the end of January. 'We Nebraska kids were a bit amused. 'And we didn't have to share the cake pile. Luckily, it's not winter, because if it was, I would not be eating perfectly in-season white Georgia peaches. 'I have lived in the South on and off for the last ten years, and this dessert strikes me as particularly Southern. 'Which, while we're on the topic of Southern food, let me just go ahead and admit that I really know little to nothing about this food culture and tradition, but I am becoming more and more interested in it the longer I live here. 'Here's what I do know: I have a much greater appreciation for shrimp and fried chicken since moving here, but I'm still not a fan of collard greens. 'But back to the peaches. 'They are my favorite summer fruit. 'They are in abundance at the farmers markets, grocery stores, and road-side stands and are a great price right now, so if you can get your hands on some, you should use some of them to make these shortcakes. Really the only thing I did differently from the original recipe was that I used less peaches, because I have so many that I just made as many as I know I will use today, and can make another batch tomorrow. 'I'm posting the original version of the recipe. I find that as delicious as these shortcakes were, I couldn't really taste the orange zest. 'If you have yet to make these, I would recommend zesting the whole orange, using half of the zest for the sugary topping, and the other half to mix into the biscuit batter. Preheat oven to 400'F. Line large baking sheet with parchment paper. 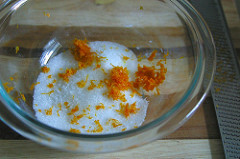 Mix 1/4 cup sugar and orange peel in small bowl, mashing peel with back of spoon until mixture is pale orange. Set aside. 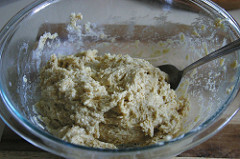 Whisk flour, cornmeal, brown sugar, baking powder, and salt in large bowl. Add butter; and cut the butter into the mixture using a pastry cutter (or you can just use your fingers) until mixture forms coarse meal. Add 2/3 cup milk; stir with fork until dough is evenly moistened, adding more milk by tablespoonfuls if dry. Drop dough by 1/3 cupfuls onto prepared sheet, forming 8 mounds and spacing 1 1/2 inches apart. Using fingers, flatten each biscuit to 2-inch round. Sprinkle with the orange sugar. 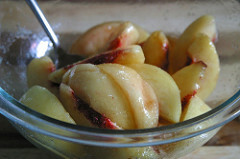 Toss peaches, 1/3 cup sugar, and vanilla in large bowl; let stand 15 minutes, tossing occasionally. Using electric mixer, beat cream and sugar in medium bowl until peaks form. Using serrated knife, cut each biscuit horizontally in half. Place bottom halves on plates. 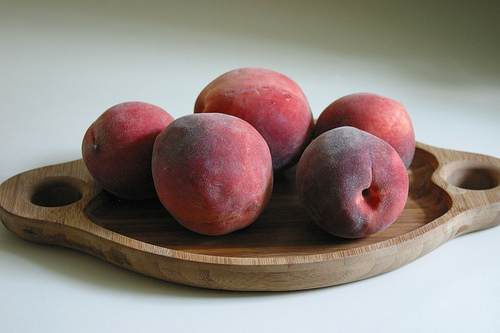 Spoon peaches and their juices onto each biscuit. 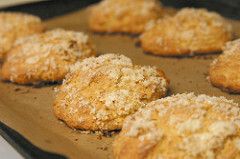 Top with whipped cream and biscuit tops. Try not to eat more than one. Good luck.